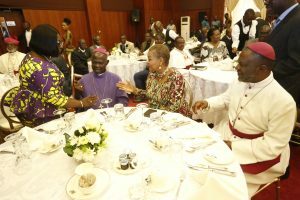 President Akufo-Addo yesterday hosted the clergy at a breakfast meeting at the Jubilee House to discuss issues affecting the church and nation in general. 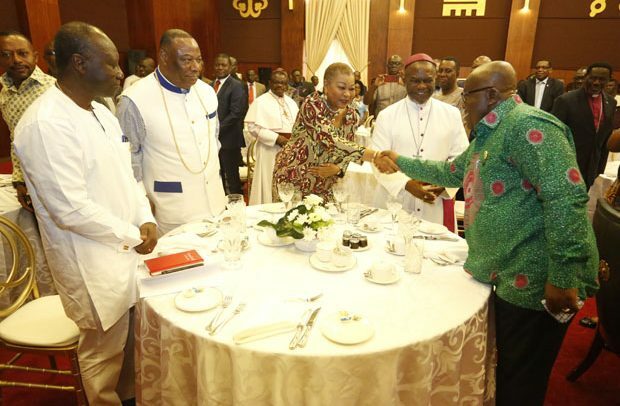 Present at the event were Archbishop Nicholas Duncan Williams of the Action Chapel, Bishop Agyin Asare of Perez Chapel, Bishop Gideon Titi Ofei of the Pleasant Place Church, Prophet Owusu Bempah of the Glorious Words Power Ministry, Archbishop Charles Palmer-Buckle, the Metropolitan Archbishop of Cape Coast, Reverend Joyce Aryee of the Salt and Light Ministry, Bishop Awotwe Pratt, outgoing Residing Bishop of the Methodist Church of Ghana, Rev. Dr Samuel Asante-Antwi, former Presiding Bishop of the Methodist Church, Rev. Dr Justice Akrofi, retired Archbishop of the Anglican Church, Reverend Clement Anchebah of the Fountain Gates Chapel, Sheikh Aremeyaw Shaibu, Evangelist Lawrence Tetteh, among others. The Chief Imam, who was conspicuously absent at the event, was ably represented. Vice-President Dr Mahamudu Bawumia and other senior government officials were also present at the parley. In his initial comments before going into the closed door meeting, the president recalled an earlier meeting he had with them to decide on Ghana’s position on the issue of Jerusalem. He, therefore, expressed hope that the meeting would be a regular feature of the government in the year for them to jaw-jaw about the things that affect them and the country. “It doesn’t mean we agree on everything, but it means we have an attitude of cooperation,” the president said. “We have an opportunity and I will hear your considerations and you will also hear the things that are on the hearts and minds of government because it’s important that from the different angles from which we approach the public interest, we work together,” he said. Some of the issues discussed were free Senior High School and the upcoming double-track system which they all accepted in the interest of equity, among others. Interestingly, discussions on the controversial 5000-seater cathedral were shelved, DAILY GUIDE learnt. Religious bodies in the country have accepted the payment of taxes on all activities and operations that bring them incomes. It follows the raging debate over whether or not religious bodies should be made to pay taxes. “Probably charity things that are coming from within are non taxable things, but I believe that in principle if a religious body is engaging in a private venture for profit, that body must be taxed,” he emphasised. “Churches are already paying taxes as individuals on salaries, and churches also pay taxes on businesses that they set up; so now it must be much more of a permanent issue in the context of the fact that everybody is made to do what is already there. With the regulatory body being set up, everybody will be compelled to do what is right,” he noted.